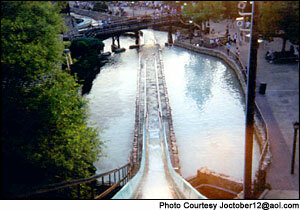 Saw Mill Log Flume is a flume ride in Frontier Adventures at Six Flags Great Adventure. It's worth seeing on a time-permitting basis. Take a ride on the Saw Mill Log FLume! Splash down a number of falls, cruise through forests and experience a tradtional wester river ride!